Congratulations to "Maureen C.", the winner in Dana's giveaway. Thank you to everyone who participated! When I gave birth to my first child, I experienced a joy that was equal to nothing else, but the emotions that accompany parenthood were twofold. I felt pure fulfillment when holding my beautiful new daughter, but I also remember the fear that crept in every time she was out of my sight. Being a mother isn’t just about changing diapers and reading nursery rhymes. It’s a new world of worries and fears. As a young woman, I never worried about my safety much. I guess like all young people, I felt a sense of immortality. Once I had my own child, that all changed. I not only worried about this new little being with whom I was responsible for, but I also realize how much this little being was dependent on me. She needed me for food, water, comfort. . .survival. Yes, if anything would have happened to me, my daughter would have been cared for by someone, but someone is never the same as your own mother. Precious Embrace explores this theme from two sides, the loss of a child and the loss of a parent. Ali and Johnny have both lost parents. They live everyday trying not to let these losses define who they are. But when Micah is stolen, Ali and Johnny experience the ultimate fear. The sickeningly intenseness of this fear rivals none other. Portraying this was no easy feat for me. I had to put my mind in a place I never, as a mother, wanted to go. It was difficult to say the least, but so worth the experience. Ali and Johnny need get a grip on their fear and come together to support each other through what could or could not be the loss of Micah. How do you live through the loss of your child? How do you get out of bed every day when you don’t know if your child is dead or alive? How do you move forward when your mind and body are riddled with despair? Can Ali and Johnny come together and build the family they both desire when so many things conspire against them? As the tag line suggests, Precious Embrace will take you on a rollercoaster ride between a new love, a missing child, and in the end, you’ll get to experience the beginning of a found family. GIVEAWAY: I will be giving away one ebook copy of Precious Embrace to one lucky commenter. Dana Mason started writing to prove to her computer geek husband and her math & science geek kids that she actually has a brain; it's just a right functioning brain instead of a left. She's lived all over the country and uses that experience in her writing and character studies. 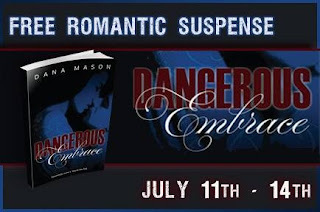 Her debut novel, Dangerous Embrace, is the first in a romantic suspense series about a group of friends from Northern California who learn just how short life can be when you don't hold on to what's important. When not writing, Dana specializes in professional development and training. She's also a board member on the local Art's Council and does what she can to support the art community. Giveaway ends 11:59pm EST July 12th. Please supply your email in the post. You may use spaces or full text for security. (ex. jsmith at gmail dot com) If you do not wish to supply your email, or have trouble posting, please email maureen@JustRomanticSuspense.com with a subject title of JRS GIVEAWAY to be entered in the current giveaway. Wow... sounds like your book will be emotional... I truly enjoy books that make me feel something... go through the journey and emotions along with the characters... thank you for sharing. Thanks, Colleen! I hope it's emotional for the reader. It was certainly emotional to write. Thanks for stopping by. I still remember the first time I held my precious first born. my heart felt too big for my chest. I cannot imagine how I would feel if I lost him. I am sure I will need lots of tissue to get thru your book. When my kids were little I couldn't stand watching any movies that had kids in danger. It was just too horrible of a thought. When my daughter was born, it was around the same time Susan Smith rolled her car into the lake with her two sons inside. I'll never forget how sick that made me. It just reinforced my fears and made me wonder what on Earth would ever drive a mother to something so awful. It's just so hard not knowing where a loved one is and whether he is safe and being treated well. I can't image anything worst than not knowing. When my son was born, he's my first, I felt an over-whelming sense of being responsible for another person. It literally hit me - full force. That's exactly how I felt. It's like, oh, hell, now I HAVE to be responsible. :) Thanks, Mary! So, a box of tissues to go along with your book? This may sound odd but I really appreciate stories that can evoke this kind of emotion. I especially love it when I get to smile at the end. Thanks for taking on a tough topic. I cannot imagine how people survive the limbo of a missing child. It's the worst my brain can imagine. Yes, you might want to bring some tissue to the party. :) I agree, if I don't laugh or cry, I feel like the book was lacking something. Thanks, Jonetta, for commenting. Congrats Dana on the new release! sounds intense! Thanks for sharing. Thank you, Erin. I hope you'll check out Precious Embrace. Thanks for stopping in and saying hello.